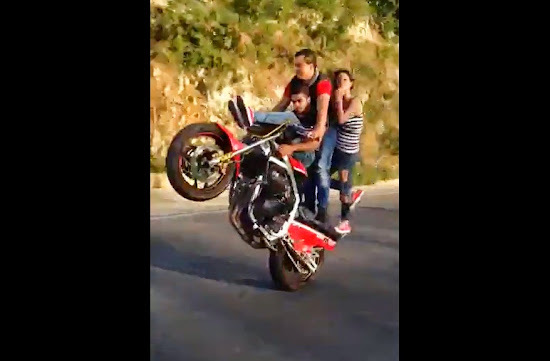 This is in Lebanon craziest stunts in the world that is nothing comparing to what happens there. Super dangerous wheelie, with NO GEAR WHATSOEVER. I wish there was a nice way to say it but, Dumb Dumb Dumb. Would have been awesome if they were at least geared up. Skill will only do so much for you. Guys have some gear on but that girl dont... Be a man and give you gear to your woman if you take her for a ride!